In general, garage doors are pretty reliable, but there may come a time when you need repair. If you live in the Cincinnati, Ohio area and need garage door repair, Overhead Door Co. of Greater Cincinnati has you covered! Not only do we offer prompt service, but we are available whenever you need us—24 hours a day, 365 days a year. And our garage door repair experts have experience working with all different types of doors. Overhead Door Co. of Greater Cincinnati offers both residential and commercial garage door repair to meet every need—contact us online or give us a call at (513) 394-6938 today. There are many different reasons your garage door may require repair. No matter what your situation is, it’s not recommended that you try to fix it yourself. This could end up doing more damage and could result in you having to pay more money. 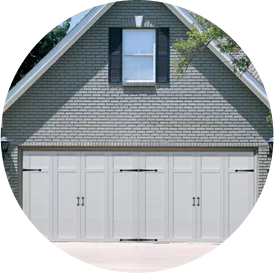 If you need someone to fix garage doors, we’re here for you. Whether something is wrong with the door’s motor, springs, cables or rollers/track, we will determine what the problem is and fix it quickly and efficiently. From simple garage tune-ups to major repairs and replacement, our team does it all. Contact us online to schedule garage door service in the Cincinnati area. Garage door repair for your home is important, and commercial garage door repair is equally important. If the doors at your firehouse, storage facility, warehouse or other building aren’t working properly, you need to get them fixed right away. We understand this and offer prompt service. If weather or fire damage destroys your company’s merchandise that is in the warehouse, this could ruin productivity, cost you extra money and more. Even worse, if the doors at your storage facility aren’t working and clients’ belongings get ruined, this could spell big trouble for you. With timely garage door repair—or, if necessary, garage door replacement—these problems can be prevented. Contact us online today or call us at (513) 394-6938 for commercial garage door service. We offer 24-hour emergency service.